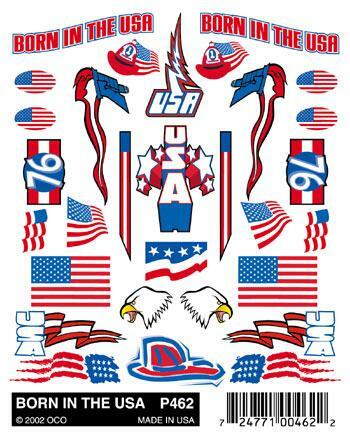 "Born In the Usa" is a set of Stick-On Decals for Your Pinewood Derby Cars from Pine Car. Retail $3.99 SAVE 20% ! High-quality accessories that give your PineCar a personalized look. No mess...just peel and stick. Graphics include: USA flag, fireman's hat with USA flag, hand-held flaming torch, eagle's head, and more.